This full coverage hood is windproof, water proof, and comfortable, making it a great alternative to a neoprene hood for windsurfing or kiteboarding on chilly days. It is also thin enough to fit under most helmets. 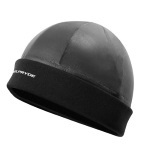 Made of urethane coated fleece material, and constructed with rugged overlocked seams.